The Ainokaze Toyama Railway is a semi-private railway company in Toyama Prefecture. It is owned by a mixture of local government and local businesses. The company operates a railway line between Kurikara Station in Ishikawa Prefecture and Ichiburi in Niigata Prefecture. Previously this line was part of the Hokuriku Main Line, but was separated from the JR railway network in March 2015, when the Hokuriku Shinkansen was extended to Toyama Station and Kanazawa Station. Though this line does not connect directly with Kanazawa Station, at Kurikara Station the line connects with the IR Ishikawa Railway Line. Both the Ainokaze Toyama Railway and the IR Ishikawa Railway run regular through train services on these two lines that connect Kanazawa Station with Toyama Station, and Tomari Station. There are 21 stations on the Ainokaze Toyama Railway Line. The key destinations are listed below with fares and example train times given from Kanazawa Station. Kurikara Station is the eastern terminus of the IR Ishikawa Line and links the Ainokaze Toyama Railway Line with Kanazawa Station. Takaoka is Toyama Prefecture’s second largest city. Attractions here include the 16m high Great Buddha Statue (“Takaoka Daibutsu”), Zuiryuji Temple a designated National Treasure that dates from 1645, and the preserved wooden residences and earthern storehouses of the Kanayamachi district. Transfers can be made here to JR West’s Johana Line and Himi Line. Toyama is the capital city of Toyama Prefecture. Its major tourist attractions are Toyama Castle and boat trips on the Matsukawa River. The city is also convenient for hiking routes along the Tateyama Mountain Range. Transfer here to the Toyama Chiho Railway Main Line and to JR Central’s Takayama Main Line which connects Toyama Station to Gifu Station in Gifu. Namerikawa is a coastal city famous for its hotaruika or “firefly squid”. These sparkling squid rise from the sea in large numbers each spring. The city has its own Firefly Squid Museum and from late March to early May there are nighttime sightseeing cruises that take visitors to view the squid being caught and eat them fresh from the sea. At Namerikawa Station transfers can be made to the Toyama Chiho Railway Main Line. The city of Uozu has two unusual attractions. Between 1500 and 2000 years ago a coastal cedar forest here was buried and now its roots are on display at The Uozu Buried Forest Museum. The city is also famous for its spring mirages which can be seen over the sea from April to June. These mirages can be best observed from an observation deck at the Buried Forest Museum or from the Ferris Wheel at the Mirage Land amusement park. From this station you can access both the Unazuki Onsen hot spring resort and the scenic Kurobe Gorge, one of Japan’s deepest and most beautiful ravines. From Kurobe Station transfer to Dentetsu Kurobe Station. You can get there on foot in 14 minutes or by taxi in 4 minutes. At Dentetsu Kurobe Station take a local train to Unazuki Onsen Station. The journey costs 730 yen and takes 35 minutes. Sightseeing trains for the Kurobe Gorge depart from nearby Unazuki Station. 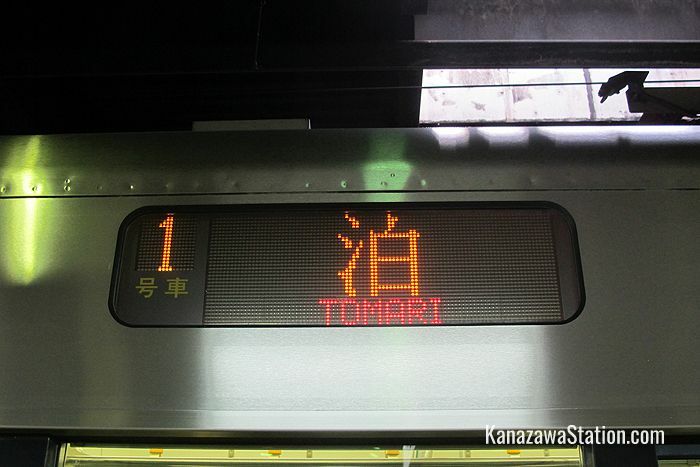 Many through services from Kanazawa Station terminate at Tomari Station. It is possible to transfer here to through services for the semi-private Echigo Tokimeki Railway’s Nihonkai Hisui Line. This line runs to destinations in Niigata Prefecture. Ichiburi Station in Niigata Prefecture is jointly operated by the Ainokaze Toyama Railway and Echigo Tokimeki Railway. This is the eastern terminus of the Ainokaze Toyama Railway Line. This station in Niigata Prefecture is operated by the Echigo Tokimeki Railway. 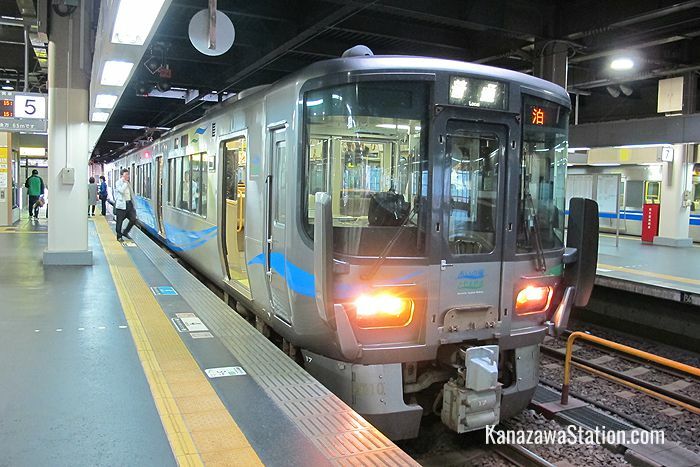 One through train service each day travels from Kanazawa Station all the way to Itoigawa Station. 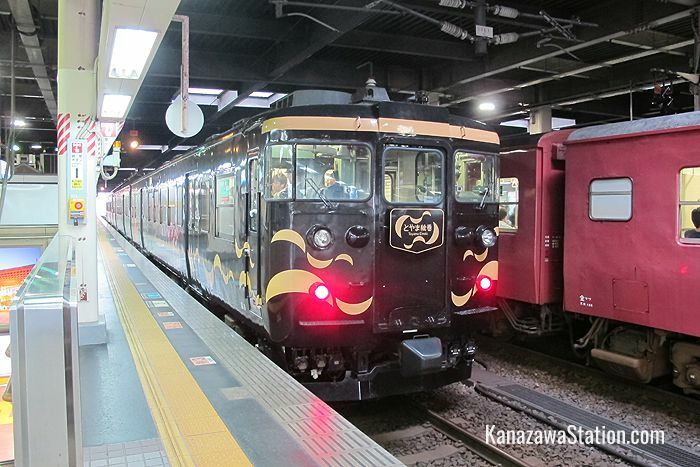 The train leaves from Platform 4 at Kanazawa Station at 17.39, travels along the IR Ishikawa Railway Line to Kurikara Station and then continues along the Ainokaze Toyama Railway Line. From Ichiburi Station it then continues on Echigo Tokimeki Railway’s Nihonkai Hisui Line until it reaches Itoigawa at 19.51. Itoigawa Station is situated in a UNESCO Global Geopark and has an unusual tourist information center at Itoigawa Station. Called Itoigawa GeoStation GeoPal the facility combines a Geopark Tourist Information Center with a Model Railroad & Diorama Gallery and a waiting room in which a preserved KiHa 52 diesel train is on display. Local attractions include the Fossa Magna Museum (dedicated to a dramatic local fault line in the earth’s crust), plenty of hot springs, and a scenic landscape ideal for hiking, cycling, and rock climbing. The Ainokaze Liner is a limited stop rapid service that runs on weekdays at peak travel periods between Kanazawa and Tomari stations. All seats are reserved on this train and there is an extra fee of 300 yen for the reservation. This service does not run on weekends or on holidays. 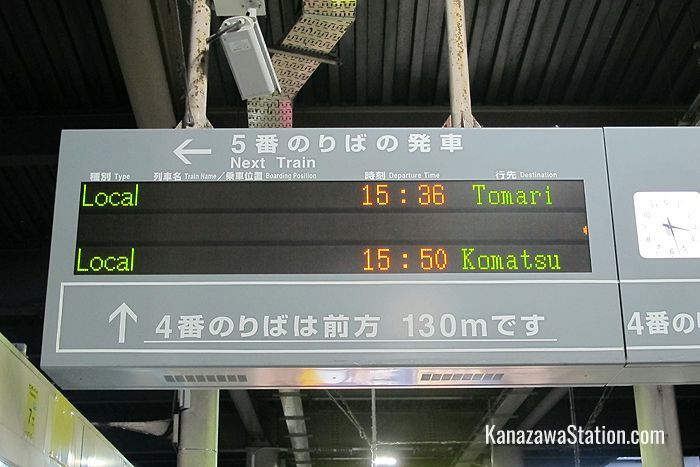 Below are the travel times from Kanazawa Station for the main stops on this service. As the Ainokaze Toyama Railway is not part of the JR railway network, it is not covered by the Japan Rail Pass. However, the Japan Rail Pass can be used to travel on this line between Takaoka Station and Toyama Station as these two stations are partly operated by JR West. To use the Japan Rail Pass between these two stations you must use a local train, and you cannot get off at any other station between Takaoka and Toyama. The Japan Rail Pass can only be used between these two stations, and cannot be used for any other stations on this line.